She picked a beautiful red suit from the label Rimple & Harpreet Narula. A heavily embroidered full sleeved suit worn with a sheer red dupatta. We loved everything about this look. Let's highlight some of its unique feature: its splendid intricately designed skirt, scoop neck, its beautiful embroidery and gotta work on the dupatta. 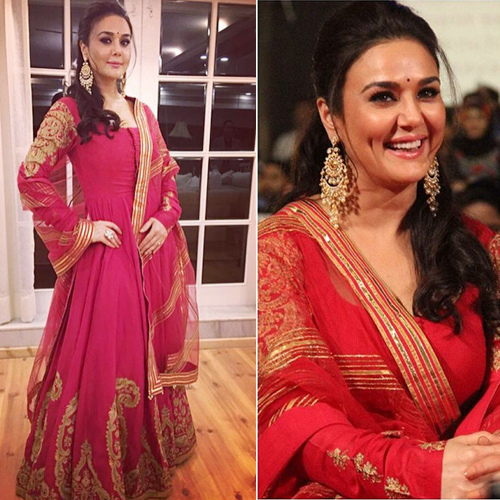 Preity kept it simple and let this heavy lookbook do the talking. She wore her hair half tied and finished the look with a gorgeous pair of earrings and a bindi.